Infringement enforcement in Victoria is hopelessly complex and almost impossible to navigate. There's no question that the complexity of the system drives many people to pay their tickets rather than challenge them. Unfortunately, that's not an option for everyone. I've mentioned before that the VLA's Workers' Guide to Fines is a useful reference when trying to get to grips with the system. 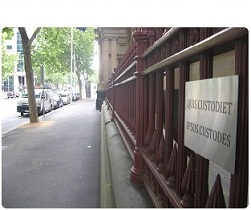 The information in the online Fitzroy Legal Service Handbook is also handy. I want to add this chapter from PILCH's Homelessness Law & Advocacy Resource Manual to that list. Don't be put off by the title. Although specific information is provided that is relevant to the homeless, most of the information contained in the Manual can apply to anyone. The Manual only claims to be current up to July 2008, but the important thing is that it takes into account the major changes brought in by the Infringements Act 2006. The Public Interest Law Clearing House (VIC) Inc. (PILCH) is an independent, not-for-profit organisation which is committed to furthering the public interest, improving access to justice and protecting human rights. PILCH does this by facilitating pro bono legal services to Victorian individuals and organisations in need, and by undertaking law reform, policy work and legal education. Their site design is a little counter-intuitive, but well worth a look.